And touch the ground that will become your grave. That shackle you and bind you like a slave. And whilst this is your tomb it is not home. Like any fault or flaw would make you weep. And let your thoughts into the ether seep. And claim it as our own insightful dream. And yet too long to have been made by spray. With liberated trails left in the clay. Your findings help us probe that ancient sky. 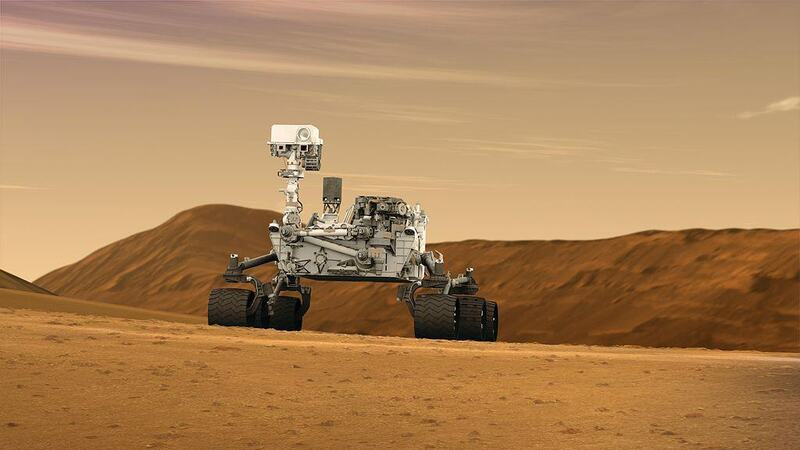 An artist’s concept of the Mars Curiosity rover (Photo Credit: NASA/JPL-Caltech [Public domain], via Wikimedia Commons). This is an Ottava Rima inspired by recent research that found a new type of sand dune on Mars. On Earth, the wind produces two distinct types of sand dunes: those that have ripples that are approximately 10 cm in length, and those which are a few hundred metres to a kilometre in length. However, observations from the Mars Curiosity rover have revealed that on Mars there is a distinctive third group of sand dunes that are of the order of a few metres in length. The measurements made by Curiosity were taken at the “Bagnold Dunes” on the northwestern flank of Mars’ Mount Sharp. The size of the wind-formed ripples is related to the density of the atmosphere, i.e. a thicker atmosphere would produce sand dunes that are much smaller in length. Monitoring sand dunes in areas of Mars where the age of the surface is known can then tell us information as to how thick or thin the Martian atmosphere was at various points in its existence. Current evidence seems to suggest that Mars lost most of its original atmosphere early in the planet’s history.